Strangers did not, as a rule, find their way to Chez Dom, a small, rundown Tunisian cafe on Paris' distant fringes. Run by the widow Houria and her young niece, Sabiha, the cafe offers a home away from home for the North African immigrant workers working at the great abattoirs of Vaugiraud, who, like them, had grown used to the smell of blood in the air. But when one day a lost Australian tourist, John Patterner, seeks shelter in the cafe from a sudden Parisian rainstorm, the quiet simplicities of their lives are changed forever. John is like no-one Sabiha has met before - his calm grey eyes promise her a future she was not yet even aware she wanted. Theirs becomes a contented but unlikely marriage - a marriage of two cultures lived in a third - and yet because they are essentially foreigners to each other, their love story sets in train an irrevocable course of tragic events. Years later, living a small, quiet life in suburban Melbourne, what happened at Vaugiraud seems like a distant, troubling dream to Sabiha and John, who confides the story behind their seemingly ordinary lives to Ken, an ageing, melancholy writer. It is a story about home and family, human frailties and passions, raising questions of morals and purpose - questions have no simple answer. Lovesong is a simple enough story in many ways - the story of a marriage, of people coming undone by desire, of ordinary lives and death, love and struggle - but when told with Miller's distinctive voice, which is all intelligence, clarity and compassion, it has a real gravitas, it resonates and is deeply moving. Into the wonderfully evoked contemporary settings of Paris and Melbourne, memories of Tunisian family life, culture and its music are tenderly woven. Geordie Williamson in "The Monthly": "The usual remark to be made about novels that rely on simplicity to generate their effects is that such clarity is deceptive. But with an author such as Miller - whose prose reads clear as running water, and whose insights into the ethics of storytelling, the sadness of ageing and the motions of the heart are laid out with such directness - perhaps simplicity really is the aim and the end. It is the intricate yet enduring mechanism of a successful marriage that is truly complex; Miller's fiction is the pellucid medium through which that complexity gleams." Andrew Hamilton on "Eureka Street": "Lovesong is a novel that explores its own wellsprings. The situations of its characters and its locations refract Alex Miller's own experience. Ken, the narrator is an ageing, widowed writer who listens to the story of a man whom he meets at a local pastry shop. The story rekindles his own desire to write another novel...Such intense self-reference could produce a clever, hermetic novel. But Lovesong is simple and lucid, its complexities those that a humane eye will recognise in any human life." Judith Armstrong in "Australian Book Review": "While there is great variety in Miller's novels, readers know that they can expect thoughtful treatment of significant but non-apocalyptic themes, among them attachment to land or country; displacement to new settings; deeply valued family life, often in conflict with other, equally honorable aspirations, such as the artistic vocation. Few people, of course, choose books for the sake of theme alone, what is most reliable is Miller's gift for inclusiveness. As readers, we feel instantly drawn into the lives of his characters, at home in their homes...For this reason, I am willing to bet that Miller is a favourite with book clubs -- far from a put-down. Where would literary fiction be without its constant readers?..how relieved they are when the choice falls on a work that is both sympathetic and stimulating, inclusive and interesting, thought-provoking yet able to be read in bed. The faithful will feel well rewarded by Lovesong." Mark Rubbo for "Readings": "Lovesong is a beautiful novel, very different to Miller's last four books. In some ways it is reminiscent of Conditions of Faith, which also had French and Tunisian connections, but it is not only the absolutely gripping story of Sabiha and John that makes this book so interesting, but the experience of the ageing writer, who is sucked back into telling a story." 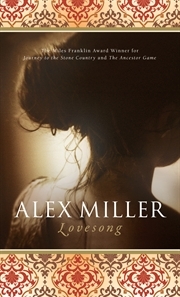 Boomert for "Boomerang Books": "Alex Miller returns to the realms of romance and desire, longing and solitariness, transience and creativity in his new deep, yet playful novel Lovesong; sure to appeal widely through its astute charm and emotional essence." Adair Jones: "Lovesong is the kind of novel that will have you thinking--and feeling -- long after you finish it." You can read a number of other reviews of the book here. Ramona Kaval on ABC Radio National's "Book Show". Angela Meyer for "Readings Monthly". On "SlowTV" you can watch the speech given by Paul Beilharz at the launch of the novel in October 2009. The author has built a number of webpages dedicated to the book which you can find here. This page contains a single entry by Perry Middlemiss published on February 10, 2010 10:37 AM. 2010 Writers at the Convent Literary Festival was the previous entry in this blog. Reprint: An Appreciation. Professor J. Le Gay Brereton by Zora Cross is the next entry in this blog.